The Knedlington collection has been designed with the contemporary bathroom in mind. 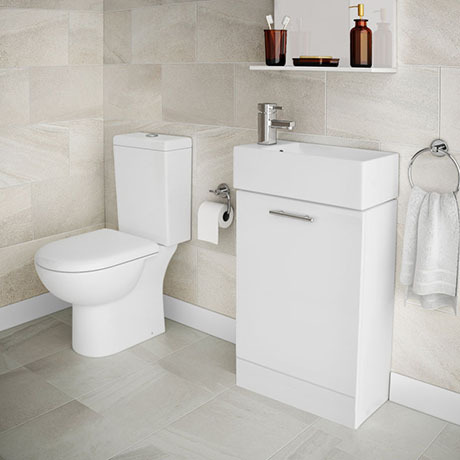 Constructed from gloss white ceramic material, the short projection close coupled toilet features a central, dual push-button flush and includes a luxury D-shape soft close top fixing toilet seat. The Cubix 480 x 230mm High Gloss White Vanity Unit with Ceramic Basin, a quality white compact cabinet and basin, part of the new minimalist furniture which will give a contemporary look to your bathroom. All white gloss vanity units feature a high quality ceramic basin. We have 3 of these toilets, which are generally good toilets, however, on each toilet the seats have come lose and move around. These are difficult to tighten in situ. Toilet is great, really pleased with it. The vanity unit is good too but the door needs some adjustment as it sticks when closing. The sink is very good though.